Virtual reality (VR) has very quickly moved from science fiction on computer monitors of scientists, engineers and even ordinary users. Today, most of us already correctly explain this concept as a three-dimensional environment that is modeled and processed by computer. The basis of virtual reality is the effort for the most faithful display of spatial models and scenes, as well as handling and creating a certain part of a real world with all its rules and regularities, movement in three dimensional space, all in real time. VR is actually a shift from the simple (two-dimensional) human-machine interaction, to a position where this interaction takes place in three-dimensional environments. These methods tend to be enhanced by the use of special peripherals that provide visual, tactile, acoustic and site interaction. The use of virtual reality in marketing has been for years applied by static visualizations of interiors and exteriors by which developers and architects present their projects. Static visualizations are therefore now the most common form . Digital designing of building is essential to avoid unnecessary construction and design misunderstanding. Virtual Reality (VR), like modern ICT tool, breaks traditional design environment by providing interactive imagery creation. Dynamic real-time visualization (DRTV), being a type of VR tool, act as a new approach to communication between customers and designers. Using game engine technology in the 3D design field has overall shorter virtual construction process . Virtual environment of DRTV should offer a wider range of control for the purpose of control of design at the real time. For this purpose it is necessary to use two main groups of devices for displaying VR (DFDVR) and controlling VR (DFCVR) . We can choose from technologies on different technological base. This devices offer different degree of immersion to VR. 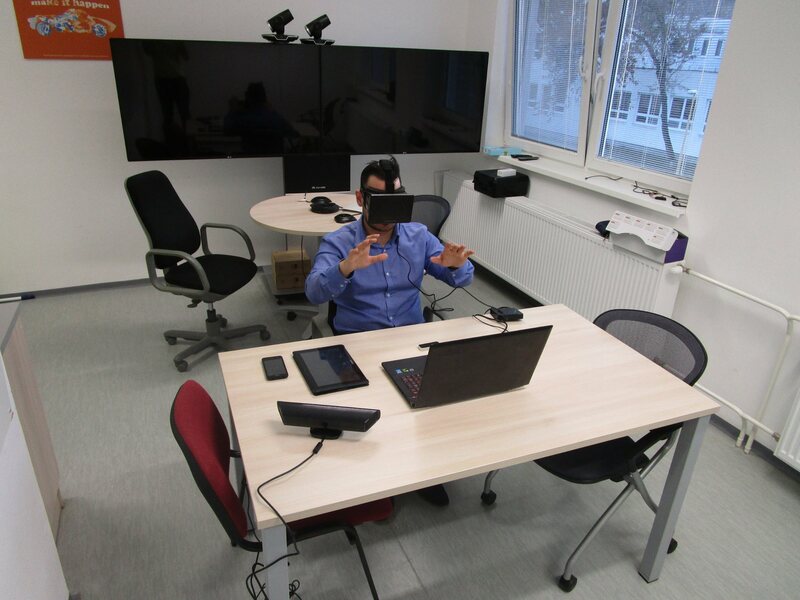 Degree of immersion declares how realistic experience in virtual environment is for customer. For develop DRTV are using Game Engine softwares. The difference between using common 3D design software and a gaming software as a 3D design software is the ability for interactive virtual environment. Users are allowed to experience a dynamic and interactive virtual environment by using 3D gaming engine as the development software for DRTV. Users can then explore the design by walking through virtual environment. Using the gaming development software acts as a dynamic design process and solution due to the freedom and limitless options that such software can offer to the field of design. Also, it provides new opportunities for comparisons with other design solutions. Technology of game engine is primarily used in developing computer games for game consoles (PC, Playstation, Xbox, etc.). With the ability to easily create virtual environments and interact with a virtual environment, this technology has found wide application in the industry of architecture and designing. Through the „game engine“ it is possible to create realistic interactive environment of interiors, where you can freely move around and designing interactively in virtual reality (move furniture and furnishings, edit the material and color solutions of interior surfaces). For the purpose of comparison we select the most popular DFDVR and DFCVR with which we work in Laboratory of Construction Technology and Management, Faculty of Civil Engineering, Technical University of Košice. All informations about technical parameters of devices were obtained from web domains of particural technology companies. The Oculus Rift is a virtual reality headset developed by Oculus comp. The Oculus Rift uses an OLED panel for each eye, with resolution of 1080×1200 dpi. These panels have a refresh rate of 90 Hz and globally refresh, rather than scanning out in lines. They also use low persistence, meaning that they only display an image for 2 milliseconds of each frame. This combination of the high refresh rate, global refresh and low persistence means that the user experiences none of the motion blurring or judder that is experienced on a regular monitor. It uses lenses that allow for a wide field of view. The separation of the lenses is adjustable by a dial on the bottom of the device, in order to accommodate a wide range of interpupillary distances. The same pair of lenses are used for all users, however there are multiple facial interfaces so that the user’s eyes can be positioned at a different distance. This also allows for users wearing glasses to use the Rift, as well as users with widely varying facial shapes. Kinect is a line of motion sensing input devices by Microsoft for Xbox 360 and Xbox One video game consoles and Windows PCs. Based around a webcam-style add-on peripheral, it enables users to control and interact with their console/computer without the need for a game controller, through a natural user interface using gestures and spoken commands. Kinect competes with several motion controllers on other home consoles, such as Wii Remote Plus for Wii and Wii U, PlayStation Move/PlayStation Eye for PlayStation 3, and PlayStation Camera for PlayStation 4. Joystick is an input device consisting of a stick that pivots on a base and reports its angle or direction to the device it is controlling. Joysticks are often used to control video games, and usually have one or more push-buttons whose state can also be read by the computer. A popular variation of the joystick used on modern video game consoles is the analog stick. Special type of control device is 3Dconnexion manufactures a line of human interface devices for manipulating and navigating computer-generated 3D imagery. These devices are often referred to as 3D motion controllers, 3D navigation devices, 6DOFdevices (six degrees of freedom) or a 3D mouse. Commonly utilized in CAD applications, 3D modeling, animation, 3D visualization and product visualization, users can manipulate the controller’s pressure-sensitive handle to fly through 3D environments or manipulate 3D models within an application. 3Dconnexion devices are compatible with over 100 applications including Autodesk Inventor, Solid Edge, Blender, Google Earth,Second Life, NASA World Wind, Virtual Earth 3D, Geomagic, Google SketchUp 6, Cinema4D, Maya, SolidWorks, T-FLEX CAD, Photoshop, and more. 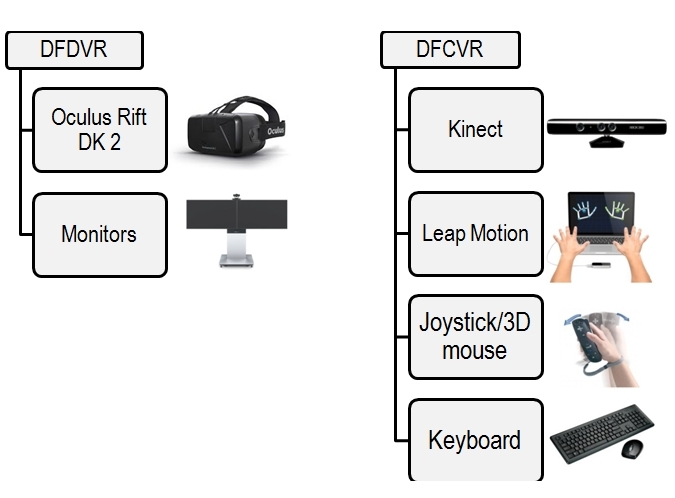 For the purpose of comparison we made VR sets (VRS) consist of a combination DFDVR and DFCVR (devices described in sec. 1). Every VRS consists from one DFDVR and one DFCVR. The VRS1 to VRS8 were tested in Laboratory of Construction Technology and Management, Faculty of civil engineering, Technical university of Košice. As assessment criteria was selected intuitive handling, display quality, availability of coding, immersion degree and availability of price. Every VRS was evaluated by degree of acceptability from „Low“. “Medium” to „High“ while testing process. Each variant of VRS was tested by author of article. As we can see every VRS provide different levels of users’ satisfaction which can be derived to advantages and disadvantages of sets. Comparison criteria were defined as intuitive handling, display quality, availability of coding, immersive degree, available of price. Nowadays monitors still provide better display quality than modern head mounted displays (HMD) like Oculus Rift DK2. This disadvantage of HMD is problem of technological level nowadays. In near future we expected that HMD technology will be comparable with monitors on this field. On the other side HMD provide high degree of immersive what is its bigger advantage against monitors. Price of both devices is on comparable degree of price availability. Modern DFCVR like Kinect and Leap Motion also provide higher degree of immersive, against traditional DFCVR, what allows more clearer experience for observer. Using modern DFCVR requires practice but is more intuitive than by traditional DFCVR. Disadvantage of preparing DRTV with support of modern DFCVR is requirement of high programming skills. Price available of modern and traditional DFCVR is also comparable. Best evaluation takes VRS6 (Oculus Rift DK2 + Leap Motion) which provides best immersive experience in VR environment. Disadvantage of this VRS is higher programming skills for using it like support tools in DRTV. Aim of this paper were define and choose best VRS for using technologies of virtual reality in field of architecture.